Though it didn't really get planned until late Thursday, my sister-in-law and I met at my mom's house for a quilty Saturday. My dad and brother went to a gun show - after lasagna for lunch and before picking up pizza for our dinner, so they were around, but were not encouraged to help quilt! I didn't get much sewing done. I took my Garden Variety quilt pieces with me and sewed pieces into rows, but then stalled out. Because there are so many rows with so many pieces, I had visions of every row being an inch or three different in length and didn't want to deal with that. I sewed seven...I guess I got further than I thought! Since this is on my UFO list and its number hasn't been called yet, I'm not worrying too much about it. It will get finished this year! And though I don't have much to show, we had a great time. I laughed till I cried a few times and we ate well. But now it's back to the "real" world today. But first, I was able to give my mom her pumpkins wall-hanging. She put it right up over her fireplace, so I got a good photo! It's always nice when someone tells you they love something, but then hang it right up in their house. Then you KNOW! And since I'm here and you're still reading, I can give you a short update about my new job. Having been there two weeks, I still love it. The people are still great, the work is still interesting and I'm enjoying it. We went on a company outing last week, first to see a robotic milker at a dairy farm (crazy technology! - oh, did I mention my job is to test milk and blood samples from dairy cows?) and then to a local cider mill for a corn maze, wine tasting and large slingshots that shoot apples. It was a great time and I felt like I fit right in already. I'm so happy to be working there. And with that, I need to get going. My immediate supervisor's birthday is Monday and the tech who is training me has a birthday on Tuesday, so CHEESECAKE! (I gotta show these people what real cheesecake is since my supervisor told me she wouldn't eat the fruit that came in the packet in the box with the cheesecake mix...there are so many things wrong with that statement, I'll just start with...what box?!) It's a new recipe, so I'll share how it turns out...Marbled New York-Style Cheesecake. I'm glad you had a fun quilty day also! I did too! Good news about your job! I agree with you are box mixes. Scratch is best. 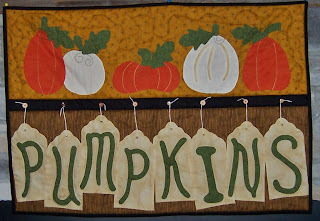 That pumpkin wall hanging is just awesome and I love the proejct you are working on. It sounds like you are having a great time with family and job. I'm glad it is going so well. 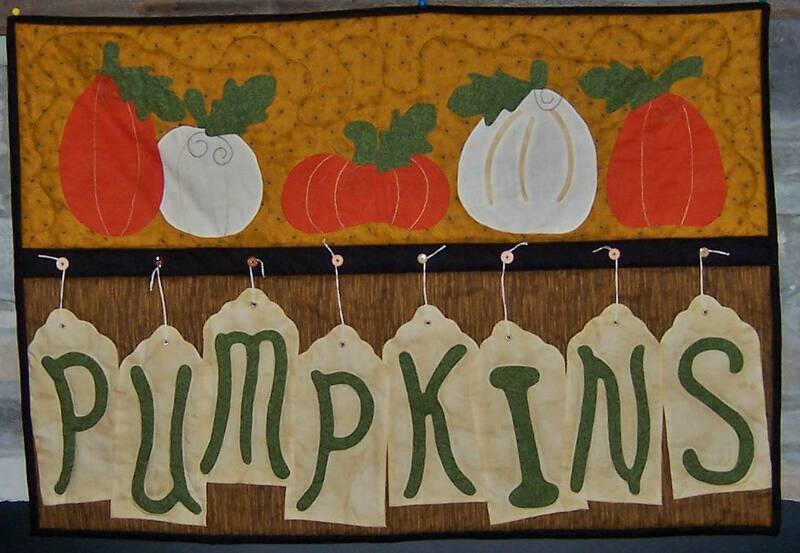 The pumpkin wall hanging looks great, even nicer than the one in the magazine. The cheesecake sounds yummy, show them what real cooking is! As for the job, cool;) I don't think I could stomach it though. Glad you had a good day of quilting with the family. Mmmm, cheesecake! I love cheesecake! Glad Mom liked her wall hanging. It really turned out cute! No doubt you are familiar with the saying, "it is to die for", in connection with some delicious treat. Well, that cheesecake is literally "to die for"! 915 calories per serving??? You've got to be kidding me! The bad thing is, I would probably eat the whole thing ---alone---in 24 hours! I love cheesecake, and printed the recipe. If I disappear from blogging, you'll know "I died for (because of) it"! *giggle* Oh, and I love your quilt, and it's great that you had such a wonderful time with your family! ---"Love"
What a fun day! Sewing with your Mom and SIL. Of course your Mom loved the Pumpkins WH. It is adorable. I love the strings on the buttons. (to the buttons?) You know what I mean. Glad you are still liking your new job and the people you work with. Sounds interesting. Yummm on the from scratch cheesecake. I made a comment on the last post, but I think it didn't go through. 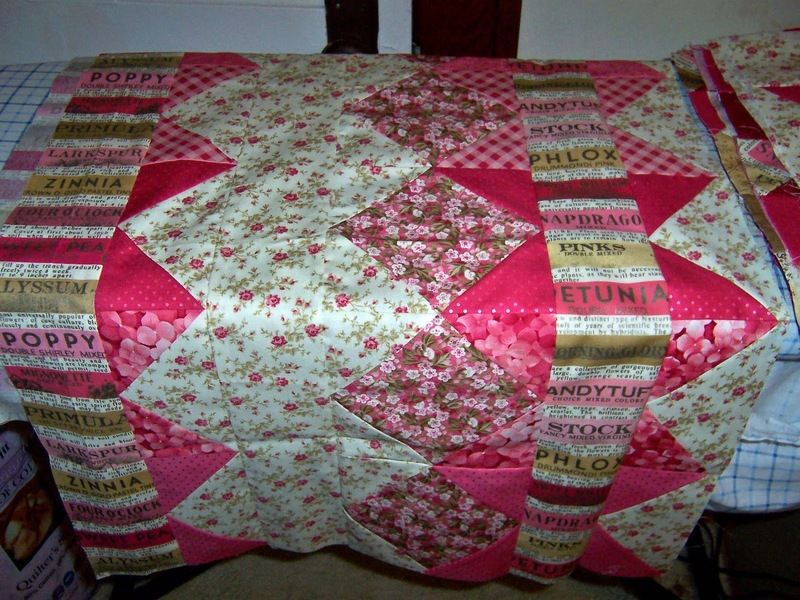 In case it didn't the quilt is beautiful. Love the colors, the setting and I think the borders are perefect.